To read this post, to listen to the video from Emergent Asset Management Ltd. and to send a message to the World Bank about looking after people rather than corporations. All I can think of is reblogging this post in the hope that maybe a few more bloggers might look at it and think about it. In 2011, “food derivative” speculation replaced financial derivatives as the hot new investment promoted by major investment banks like Goldman Sachs and JP Morgan. According to numerous studies, food speculation rather than shortages, are the main reason for skyrocketing food costs. The really scary news is that in addition to speculating heavily on food commodities, these same private equity funds are also buying up huge tracts of land in the third world. A 2009 research project by the Oakland Institute (The Great Land Grab) reveals startling facts about the corporate land grab in the third world – another major factor in skyrocketing food prices. Today, on Saturday, we actually did go out for a drive. Peter and I, we were both very happy that we actually did do this. However, we refrained from going up Macquarie Pass. I saw the clouds hugging the escarpment and urged Peter not to go up the pass. It definitely looked like there could be quite a bit of fog further up there. Not a good idea to make an elderly gent drive in the fog along all these curves of the pass, right? Not a good idea at all even though Peter is a confident driver. There was a time – many years ago – when he had to go up and down the pass every day. More likely than not he still does know every curve on that pass extraordinarily well! We agreed it would be good to go down south towards Kiama and weather permitting further on to Berry. Would it rain today? This was the question. It turned out we were lucky all day. Off and on there was a slight drizzle. But no rain to speak of. Often there were quite threatening clouds, but also a bit of sunshine did get through in between very, very dark periods. It remained pleasantly warm for there was no wind, none at all. We could really call ourselves lucky that the weather had turned out all right after a very doubtful start in the morning. Major roadworks are currently underway and are due for completion in 2014. Commenced in 2012, the major infrastructure project will include a new overpass over the Omega rail level crossing, major highway widening, with additional exits and safer on and off ramps. Bypassing Gerringong on the highway we could see along this 7.5 kilometres stretch a lot of activity, never mind that it was Saturday. Will they be able to finish the upgrade this year? I wonder. From Kiama it was another 25 kilometres. 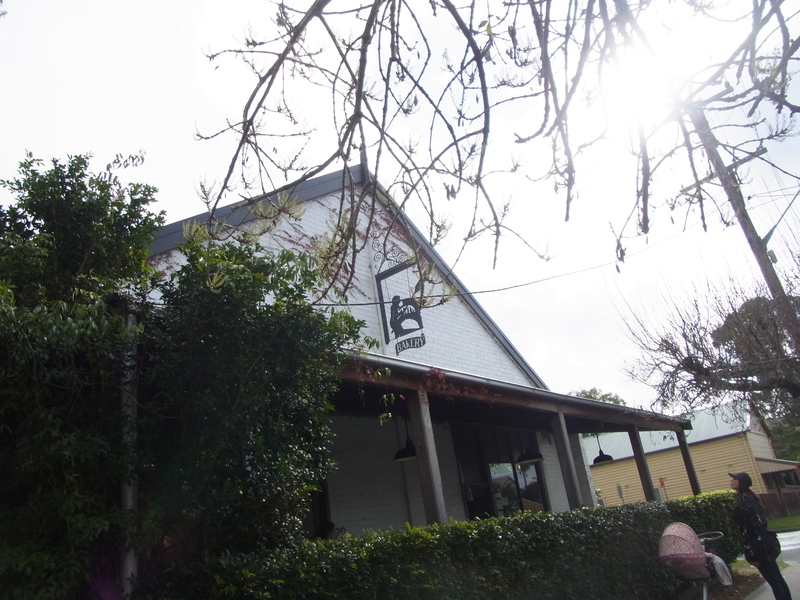 Soon we arrived in Berry for Brunch at the French Bakery Restaurant. We had big cups of coffee. 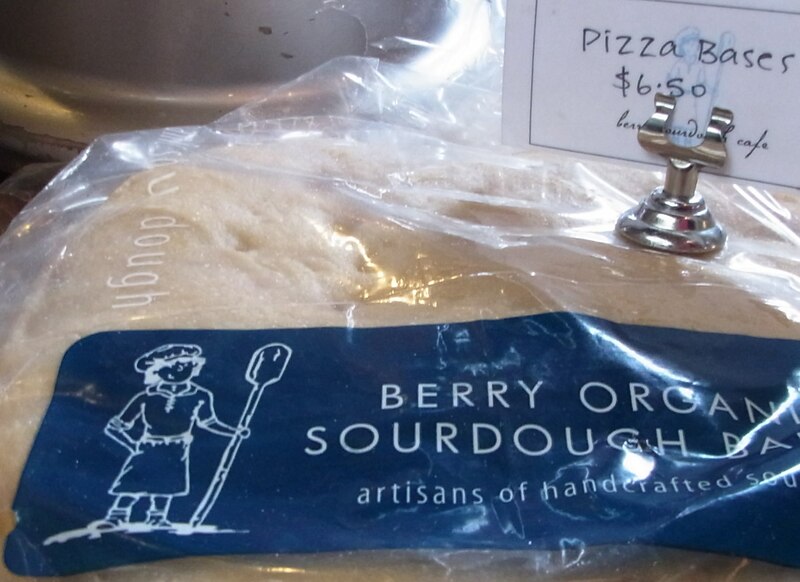 This Baker’s Sourdough Bread and Cakes are very popular. 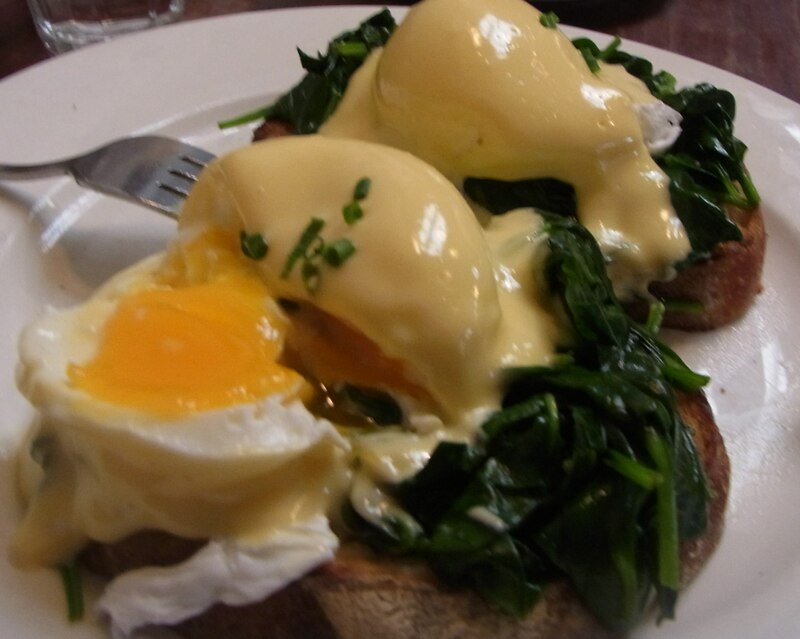 Our brunch was very good tasting and very filling. We knew we would not need any more to eat for quite some time. Strolling along the main street of Berry later on, we had a good look at the various shop displays and took quite a few pictures. Then on the way home I took some more pictures from the car, mostly pictures on that section where we had to slow down a bit because of all the road building work that was going on. I am going to publish some of these other pictures in my next post. Tomorrow is Saturday. I said to Peter: Let’s drive up to the highlands tomorrow. What for, said Peter. It’s too cold up there now. I pointed out that in the car it’s warm. For lunch we could stop at the Robertson pie shop where we could have a delicious meat-pie and some tea. Further on we could go along this secluded road to that secluded little village where we could have excellent coffee sitting outside on the verandah. We can put warm clothes on. Sure it should be good to sit outside for a while in that crisp fresh air! 🙂 We both loved this place, last time we were there. I am sure our fourteen year old little car can still make it up Macquarie Pass. It just had a big service and is still going well. And Peter’s eye-sight is quite good now. He does not need to drive with glasses any more. In the past it said on his driver’s license that he needed glasses for driving. It does not say so any more. It was changed when he renewed his license the other day. I have great memories about our last outing to the highlands. So I hope Peter can be persuaded to go on another tour like this. Why not enjoy life and drive around a bit while we still can? Indeed, why not? Lester Brown traces his life from a small farm in rural southern New Jersey through his personal evolution into the world’s foremost authority on global environmental issues. The first in his family to graduate from elementary school, he reveals what inspired him—and the millions of those who have read his books—to become environmentally active. “Simple life” redirects here. For other uses, see Simple Life (disambiguation). Mohandas Gandhi spinning yarn in 1942. 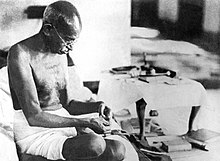 Gandhi believed in a life of simplicity and self-sufficiency. Simple living encompasses a number of different voluntary practices tosimplify one’s lifestyle. These may include reducing one’s possessions or increasing self-sufficiency, for example. Simple living may be characterized by individuals being satisfied with what they need rather than want. Although asceticism generally promotes living simply and refraining from luxury and indulgence, not all proponents of simple living are ascetics. Simple living is distinct from those living in forced poverty, as it is a voluntary lifestyle choice. Adherents may choose simple living for a variety of personal reasons, such as spirituality, health, increase in quality time for family and friends,work–life balance, personal taste, frugality, or reducing personalecological footprint and stress. Simple living can also be a reaction tomaterialism and conspicuous consumption. Some cite socio-political goals aligned with the anti-consumerist oranti-war movements, including conservation, degrowth, social justice, ethnic diversity, tax resistance andsustainable development. 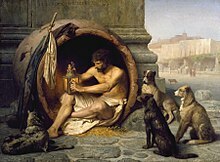 Diogenes living in a jar. 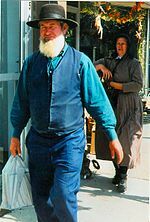 The Amish are known for their simple living andplain dress. A number of religious and spiritual traditions encourage simple living. Early examples include the Shramana traditions of Iron Age India, Gautama Buddha, and biblicalNazirites (notably John the Baptist). Jesus himself lived a simple life. In Mark 6,8-9 he tells his disciples “to take nothing for their journey except a staff—no bread, no bag, no money in their belts—but to wear sandals and not put on two tunics.” Various notable individuals have claimed that spiritual inspiration led them to a simple living lifestyle, such as Francis of Assisi, Ammon Hennacy, Leo Tolstoy, Rabindranath Tagore, Albert Schweitzer, and Mohandas Gandhi. Simple living has traditions that stretch back to the Orient, resonating with leaders such as Zarathustra, Buddha,Laozi, and Confucius and was heavily stressed in both Greco-Roman culture and Judeo-Christian ethics.Diogenes of Sinope, a major figure in the ancient Greek philosophy of Cynicism, claimed that a simple life was necessary for virtue, and was said to have lived in a wine jar. Plain people are Christian groups who have for centuries practiced lifestyles in which some forms of wealth ortechnology are excluded for religious or philosophical reasons. Groups include the Shakers, Mennonites, Amish,Hutterites, Bruderhof, Harmony Society, and some Quakers. There is a Quaker belief called Testimony of Simplicity that a person ought to live her or his life simply. The Islamic prophet Mohammed preached the followers of Islam to lead a life of simplicity. Henry David Thoreau, a North American naturalist and author, is often considered to have made the classic secular statement advocating a life of simple and sustainable living in his book Walden (1854). Thoreau conducted a two-year experiment living a plain and simple life on the shores of Walden Pond. In Victorian Britain, Henry Stephens Salt, an admirer of Thoreau, popularised the idea of “Simplification, the saner method of living”.Other British advocates of the simple life included Edward Carpenter,William Morris, and the members of “The Fellowship of the New Life“.C.R. Ashbee and his followers also practiced some of these ideas, thus linking simplicity with the Arts and Crafts Movement. British novelist John Cowper Powys advocated the simple life in his 1933 book A Philosophy of Solitude. John Middleton Murry and Max Plowman practised a simple lifestyle at their Adelphi Centre in Essex in the 1930s. Irish poet Patrick Kavanagh championed a “right simplicity” philosophy based on ruralism in some of his work. George Lorenzo Noyes, a naturalist, mineralogist, development critic, writer, and artist, is known as the Thoreau of Maine. He lived a wilderness lifestyle, advocating through his creative work a simple life and reverence for nature. During the 1920s and 1930s, the Vanderbilt Agrarians of the Southern United States advocated a lifestyle and culture centered upon traditional and sustainable agrarian values as opposed to the progressive urbanindustrialism which dominated the Western world at that time. Thorstein Veblen warned against the conspicuous consumption of the materialistic society with The Theory of the Leisure Class (1899); Richard Gregg coined the term “voluntary simplicity” in The Value of Voluntary Simplicity(1936). From the 1920s, a number of modern authors articulated both the theory and practice of living simply, among them Gandhian Richard Gregg, economists Ralph Borsodi and Scott Nearing, anthropologist-poet Gary Snyder, and utopian fiction writer Ernest Callenbach. E. F. Schumacher argued against the notion that “bigger is better” in Small Is Beautiful (1973); and Duane Elgin continued the promotion of the simple life in Voluntary Simplicity (1981). The Australian academic Ted Trainer practices and writes about simplicity. Living simply in a small dwelling. Some people practice simple living by reducingconsumption. By lowering expenditure on goods or services, the time spent earningmoney can be reduced. The time saved may be used to pursue other interests, or help others through volunteering. Some may use the extra free time to improve their quality of life, for example pursuing creative activities such as art and crafts (see starving artist). Developing a detachment from money has led some individuals, such as Suelo and Mark Boyle, to live with no money at all. Reducing expenses may also lead to increase savings which can lead to financial independence and the possibility of early retirement. The grassroots awareness campaign, National Downshifting Week (UK)(founded 1995) encourages participants to positively embrace living with less. Campaign creator, British writer and broadcaster on downshifting and sustainable living, Tracey Smith says, “The more money you spend, the more time you have to be out there earning it and the less time you have to spend with the ones you love.” National Downshifting Week encourages participants to ‘Slow Down and Green Up’ and contains a list of suggestions for individuals, companies, children and schools to help adopt green or eco-friendly policies and habits, develop corporate social and environmental responsibility in the workplace, and create eco-protocols and lessons that work alongside the national curriculum, respectively. 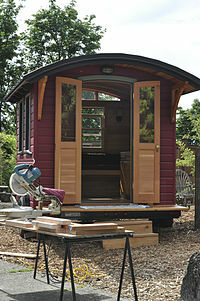 Reducing possessions or the size of home can also form part of simple living. The 100 Thing Challenge is a grassroots movement to whittle down possessions to a mere 100 items, with the aim of decluttering and simplifying people’s lives. The small house movement includes individuals who chose to live in small mortgage-free low-impact dwellings, such as log cabins or beach huts. 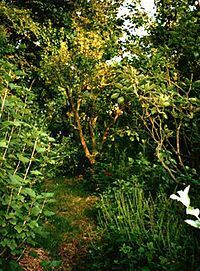 Robert Hart‘s forest garden in Shropshire, England. One way to simplify life is to get back-to-the-land and grow your own food, as increased self-sufficiency reduces dependency on money and the economy.Tom Hodgkinson believes the key to a free and simple life is to stop consuming and start producing. The idea of food miles, the number of miles a given item of food or its ingredients has travelled between the farm and the table, is used by simple living advocates to argue for locally grown food. This is now gaining mainstream acceptance, as shown by the popularity of books such as The 100-Mile Diet, and Barbara Kingsolver‘s Animal, Vegetable, Miracle: A Year of Food Life. In each of these cases, the authors devoted a year to reducing their carbon footprint by eating locally. City dwellers can also produce fresh home grown fruit and vegetables in pot gardens or miniature indoor greenhouses. Tomatoes, lettuce, spinach, Swiss chard, peas, strawberries, and several types of herbs can all thrive in pots. Jim Merkel says that a person “could sprout seeds. They are tasty, incredibly nutritious, and easy to grow… We grow them in wide mouthed mason jars with a square of nylon window screen screwed under a metal ring”. Farmer Matt Moore spoke on this issue: “How does it affect the consumer to know that broccoli takes 105 days to grow a head?,” […] “The supermarket mode is one of plenty — it’s always stocked. And that changes our sense of time. How long it takes to grow food — that’s removed in the marketplace. They don’t want you to think about how long it takes to grow, because they want you to buy right now”. One way to change this viewpoint is also suggested by Mr. Moore. He placed a video installation in the produce section of a grocery store that documented the length of time it took to grow certain vegetables. This raises awareness in people of the length of time actually needed for gardens and could easily be combined with online lectures to help new gardeners. People who practice simple living have diverse views on the role of technology. The American political activist,Scott Nearing, was skeptical about how humanity would use new technology, citing destructive inventions such asnuclear weapons. Those who eschew all technology are often referred to as Luddites or neo-Luddites.Although simple living is often a secular pursuit, it may still involve reconsidering personal definitions ofappropriate technology, as Anabaptist groups such as the Amish or Mennonites have done. Technological proponents see cutting-edge technologies as a way to make a simple lifestyle within mainstream culture easier and more sustainable. They argue that the internet can reduce an individual’s carbon footprintthrough telecommuting and paper usage. Some have also calculated their energy consumption and have shown that one can live simply and in an emotionally satisfying way by using much less energy than is used in western countries. Technologies they may embrace include computers, photovoltaic arrays, wind and water turbines. Technological interventions that appear to simplify living, may actually induce side effects elsewhere or at a future point in time. Evgeny Morozov warns that tools like the internet can facilitate mass surveillance and political repression. The book Green Illusions identifies how wind and solar energy technologies have hidden side effects and can actually increase energy consumption and entrench environmental harms over time. Authors of the book Techno-Fix criticize technological optimists for overlooking the limitations of technology in solving agricultural problems. Advertising is criticised for encouraging a consumerist mentality. Many advocates of simple living tend to agree that cutting out, or cutting down on, television viewing is a key ingredient in simple living. Some see the Internet,podcasting, community radio, or pirate radio as viable alternatives. Simple living may be undertaken by environmentalists. For example, Green parties often advocate simple living as a consequence of their “four pillars” or the “Ten Key Values” of the Green Party of the United States. This includes, in policy terms, their rejection of genetic modification and nuclear power and other technologies they consider to be hazardous. The Greens‘ support for simplicity is based on the reduction in natural resource usage and environmental impact. This concept is expressed in Ernest Callenbach‘s “green triangle” of ecology, frugalityand health. 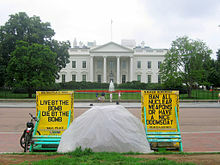 The White House Peace Vigil, started by simple living adherentThomas in 1981. Opposition to war has led peace activists, such as Ammon Hennacy and Ellen Thomas, to a form of tax resistancein which they reduce their income below the tax threshold by taking up a simple living lifestyle. These individuals believe that their government is engaged in immoral, unethical or destructive activities such as war, and paying taxes inevitably funds these activities. A new economics movement has been building since the UN conference on the environment in 1972, and the publication that year of Only One Earth, The Limits to Growth, and Blueprint For Survival, followed in 1973 bySmall Is Beautiful: Economics As If People Mattered. Recently, David Wann has introduced the idea of “simple prosperity” as it applies to a sustainable lifestyle. From his point of view, and as a point of departure for what he calls real sustainability, “it is important to ask ourselves three fundamental questions: what is the point of all our commuting and consuming? What is the economy for? And, finally, why do we seem to be unhappier now than when we began our initial pursuit for rich abundance?”In this context, simple living is the opposite of our modern quest for affluence and, as a result, it becomes less preoccupied with quantity and more concerned about the preservation of cities, traditions and nature. A reference point for this new economics can be found in James Robertson‘s A New Economics of Sustainable Development, and the work of thinkers and activists, who participate in his Working for a Sane Alternativenetwork and program. According to Robertson, the shift to sustainability is likely to require a widespread shift of emphasis from raising incomes to reducing costs. Jump up^ Griffiths, Michael. B., Flemming Christiansen, and Malcolm Chapman. (2010) ‘Chinese Consumers: The Romantic Reappraisal’. Ethnography, Sept 2010, 11, 331–57. ^ Jump up to:a b c “Low Income/Simple Living as War Tax Resistance”. NWTRCC. Jump up^ Slocock, N. (May 2004). “‘Living a Life of Simplicity?’ A Response to Francis of Assisi by Adrian House”. ^ Jump up to:a b Shi, David. The Simple Life. University of Georgia Press (2001). Jump up^ Parry, Richard. “Ancient Ethical Theory”. Stanford Encyclopedia of Philosophy. Retrieved 16 September 2012. Jump up^ Marshall, Peter. Nature’s Web: Rethinking Our Place on Earth. M.E. Sharpe, 1996 (pp. 235; 239–44). Jump up^ Salt quoted in Peter C. Gould, Early Green Politics, p. 22. Jump up^ Fiona Maccarthy, The Simple Life: C.R. Ashbee in the Cotswolds (London, 1981). Jump up^ A Philosophy of Solitude, London, 1933. See also David Goodway, Anarchist Seeds Beneath the Snow (Liverpool, 2006), pgs. 48–9, 174, for Goodway’s comparison of Powys’ ideas of the Simple Life to Carpenter’s. Jump up^ Hardy, Dennis. Utopian England: Community Experiments 1900–1945 p. 42. Hardy’s book details other simple living movements in the UK in this period. Jump up^ “Kavanagh’s Lessons for Simple Living”. Irish Times. November 23, 2009. Jump up^ Osborne, Hilary (23 July 2009). “Daniel Suelo: Free spirit or freeloader?”. The Guardian (UK). Retrieved 20 October 2011. Jump up^ Salter, Jessica (18 August 2010). “The man who lives without money”. The Telegraph (UK). Jump up^ Robinson, Nancy (2 August 2012). “Retiring At Age 50 Is Realistic Using These Unorthodox Strategies”. Forbes(US). Retrieved 20 August 2012. Jump up^ Lisa McClaughlin (June 5, 2008). “How to Live with Just 100 Things”. Time. Jump up^ “Less is more: Simple living in small spaces”. BBC News. 28 December 2011. Jump up^ Tom Hodgkinson (2006). How To Be Free. Jump up^ Robert Hart. Forest gardening: Cultivating an edible landscape. p. 97. Jump up^ Robert Hart (1996). Forest Gardening. p. 45. Jump up^ Merkel, Jim. Radical Simplicity. British Columbia: New Society, 2003. Print, 170–71. ^ Jump up to:a b Mark, Jason. “How Does Your Garden Grow? Watch and See” food.change.org. Sustainable Food. 26 Feb 2010. Web. Jump up^ Scott Nearing (2006). Civilization and Beyond. p. 101. Jump up^ Sale, K. (February 1997). “America’s New Luddites.” Le Monde diplomatique. Jump up^ Evgeny Morozov (2011). The Net Delusion: The Dark Side of Internet Freedom. Jump up^ Zehner, Ozzie (2012). Green Illusions: The Dirty Secrets of Clean Energy and the Future of Environmentalism.University of Nebraska Press. Jump up^ Huesemann, Michael H., and Joyce A. Huesemann (2011). Technofix: Why Technology Won’t Save Us or the Environment, New Society Publishers, Gabriola Island, British Columbia, Canada, ISBN 0865717044, 464 pp. Jump up^ John Barry; E. Gene Frankland (2002). International Encyclopedia of Environmental Politics. Routledge. p. 161. This page was last modified on 20 May 2014 at 19:34. 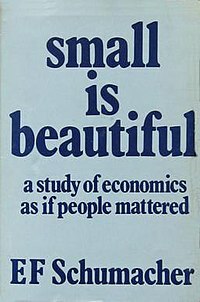 Small Is Beautiful: A Study of Economics As If People Mattered is a collection of essays by British economist E. F. Schumacher. The phrase “Small Is Beautiful” came from a phrase by his teacher Leopold Kohr. It is often used to champion small,appropriate technologies that are believed to empower people more, in contrast with phrases such as “bigger is better”. First published in 1973, Small Is Beautiful brought Schumacher’s critiques of Western economics to a wider audience during the1973 energy crisis and emergence of globalization. The Times Literary Supplement ranked Small Is Beautiful among the 100 most influential books published since World War II. A further edition with commentaries was published in 1999. With great interest I read up in Wikipedia what it says about E.F. Schumacher. The publication of the above essays I find especially interesting. This is why I copied this Wikipedia page , hoping it might inspire other bloggers to find out more about EF. Schumcher. After a night with a lot of cramping in my legs I ask myself what did I do wrong? Does it perhaps have to do with not going for a walk the day before? If I would stick to my perfect plan I would go for a walk every day. Why then, why did I not take care to fit it in yesterday, on Sunday? 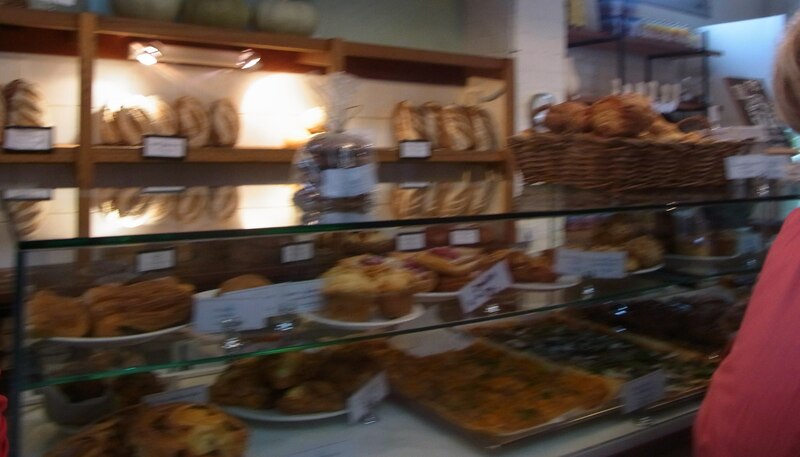 For instance, we drove to the Club in the afternoon for our coffee and cake. Why did I not say to Peter, let’s walk to the club? Why didn’t I think of it? Actually I cannot see any reason at all why we should not have been able to walk. When I could not sleep during the night because of the cramping I thought a lot about what I had been reading yesterday on the internet and also what I had been reading in kindle. Well, in kindle I have finally come to the last pages of ANNA KARENINA. Tolstoy wrote in this novel not just about AK. A lot of other people are written about in great detail, especially LEVIN, one of the big landowners. But I can see now how ANNA has turned into the main character of this book. She is a woman of her time and her circumstances, seen through the eyes of a male writer who definitely has a lot of insight into what a woman’s feelings may be. LEVIN’s connection with the land is dealt with in great detail in the novel and seems to have a lot to do with Tolstoy’s feelings about land ownership. And this brings me to what I have been reading and reblogging yesterday about HENRY GEORGE and the land question: How the way the land is taxed or not taxed affects our lives. It is said if we had what is called a “single tax” we would have a more just society. A single tax on what you may ask. Well, we are talking here about a single tax on land. Of course, whoever owns some land, would not want such a tax. I learned yesterday about Neoclassical Economics. Apparently this is being taught at universities these days. Everyone who is being taught NCE would be discouraged to consider the teachings of HENRY GEORGE. The teaching of NCE protects the established land ownership and goes against the teachings of HENRY GEORGE. This is the way I see it. Tell me if I am wrong. If you belong to the top third in society, of course you want things to remain the way they are. For sure, the very,very top want to continue ‘earning’ millions every year without paying any taxes. If you are more in the middle, you are constantly in danger of falling behind, but you have hopes of eventually arriving in the top where you are safe. The bottom third in society they are the ones who can be squeezed in all sorts of ways. Entitlements or security for them? Most countries cannot afford it or soon won’t be able to afford it any more. If more and more people in the bottom third become more and more destitute, what then? Do economists ever consider this? I am sure, some do, but feel they cannot change anything.